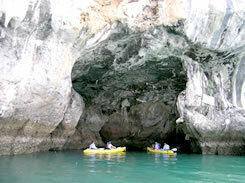 A Phuket Concierge: Places of Natural Beauty and / or Interest. Places of Natural Beauty and / or Interest. The bay can only be described as beautiful - there are a total of 83 small islands here. It cannot be reached by road - the sea is described as sapphire and the beaches are free from waste. This is Krabi’s most prominent landmark - it is two very tall hills that are next to the Krabi River. There is a popular (but unpleasant) story about bones that were dug up there. With the caves of stalactites and stalagmites this is also an interesting location to explore. It is only 15 minutes in a long tailed boat from Jao Fah Pier. This area is locally known as the ‘mountain of writings’ because of the ancient depictions of animals and boats, thought to have been written over 3,000 years ago. Most of our visitors would know this ‘James Bond Island’. It is an amazing site and if you are out in a boat it is worth a look. It is busy in the high season. From here you can get a wonderful view of Phuket and whilst you are here you can choose from a number of restaurants to eat (Tunka Café, Kao Rang Breeze and Phuket View). This is where the dead coral is - a sandy beach is covered in loads of it. This does not mean stay away - the line of pine trees along the beach has made it a secluded spot for campers and relaxation. The cape is 5km South of Takuapa. This is a superb place to watch the sunset - but away from the hustle and bustle of Patong. The powerful current of the sea, the quality of water and the sunset makes it a beautiful location - and there is a restaurant. The headland is situated at the far South of Phuket Island approximately 2 km from Rawaii beach. Does a large collection of 40 million years worth of shells interest you? Then you need to pay a visit or are you looking for snails? 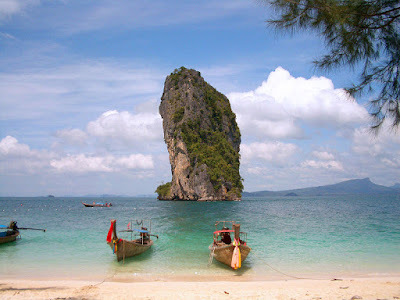 From this popular place you are able to see the bays of Kata Noi, Kata Yai, Karon beach and Koh Poo Island. There is a large area for the public to watch the beautiful view and refreshments can be purchased. 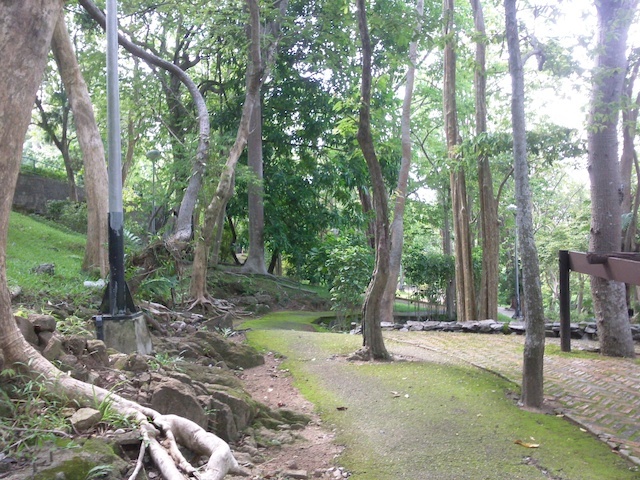 The viewpoint is located between Kata Beach and Nai Harn beach. A dramatic scene awaits you here - especially in the wet season - but the water flows all year. This can be accessed only on foot, so be prepare in the wet season - take your vehicle to 28-29 Petch Kasem road and follow the gravel road for a few kilometres and park.